At the law firm of Key, Greer, Harrison, & Casey in Pelham, we provide quality legal services with dedicated professionalism to individuals, families and businesses throughout Alabama. For more than 30 years, we have zealously and aggressively represented our clients in cases involving family law and divorce, criminal defense and DUI, personal injury and more. We strive to provide the care and guidance our clients deserve. Our attorneys are experienced, knowledgeable and thorough. No matter what legal services you seek, you will benefit from these strengths. Every case is different, which is why we take the time to learn about your case and how it is impacting your life. At our law firm, we make certain that no options or opportunities are overlooked. Do you need a guide through a complex family law matter? Have you been accused of a crime? Are you seeking compensation for a personal injury? 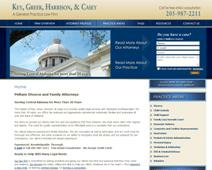 At the law firm of Key, Greer, Harrison, & Casey, we consider ourselves counselors as well as advocates. In other words, we will stand by your side to guide you through your case, in addition to putting forth every effort and using our experience to see that your needs are met. We offer free initial consultations in family law, criminal defense, personal injury and every other area of practice. We encourage you to get in touch with our law firm to learn more. Our law firm, Key, Greer, Harrison, & Casey, with offices in Pelham, Alabama, offers a variety of legal services to meet the needs of individuals, families and businesses in central Alabama and throughout the state. At Key, Greer, Harrison, & Casey, in Pelham, Alabama, our attorneys provide a range of legal services to meet the needs of people from cradle to grave. Whether you expect your divorce will be hotly contested or you think you and your spouse will part company peaceably, you need a lawyer experienced in matrimonial matters to protect your best interests. You need a lawyer who has the experience and knowledge required to aggressively protect your rights. No matter what the situation, your future and your freedom may be at risk. Even misdemeanors can tarnish a person's record. In child custody matters, the primary concern of the courts in Alabama is what is in the best interests of your children. That is as it should be. But "best interests" can be a highly subjective matter.